You ever just know something’s about to happen, but you can’t help but watch? Like a friend who makes terrible dating decisions and is about to make another one. Or a Vikings fan getting ready to watch their kicker attempt a game-winning kick (sorry, Andrew). I didn’t get a great feeling about Little when I saw the first trailer. It certainly looked like it had some humor, but it’s impossible to not draw other films like 13 Going on 30, Freaky Friday, and in particular Big, from which Marsai Martin openly admitted she drew inspiration. While I do love Big, I can’t say I went into the screening of Little with a ton of enthusiasm, thinking I’d probably seen it before. Turns out, I was close, and yet I wasn’t. I mentioned Marsai Martin earlier, and if you’re not familiar with the name yet, you likely soon will be. She won’t turn 15 until later this year, yet she’s already got a solid filmography under her belt, and with the release of Little, she’s become the youngest person in history to hold the title of executive producer on a Hollywood production. This may well end up being her breakout here, as Martin 100% nails it as the 13-year old version Jordan Sanders, who as an adult (Regina Hall) is a brilliant but absolutely ruthless tech mogul whose company is at risk of losing its biggest client. 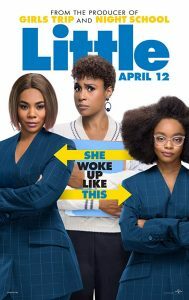 Stressed and impatient, she shows little sympathy for her assistant, April (Issa Rae), or anyone who works for her, while refusing to allow the man she’s dating (played by Luke James) to get close to her emotionally. When she finally crosses the wrong person, a young girl named Stevie (Marley Taylor), Stevie uses her magic wand (with which she’d been previously performing tricks) to turn her into a 13-year old, coincidentally the same age at which Jordan was humiliated in front of the entire school and began to treat people as objects to be used solely for her benefit. The bulk of the film is essentially a sitcom as April and Jordan adjust to their roles as they try to keep the company afloat while making it through middle school. April, finally seeing her shot to advance her career, decides to pitch her idea for an app to the investor (Mikey Day), whereas Jordan is forced to relive adolescence and remember how cruel kids can be. It’s a pretty straightforward set-up, and if you’re looking for any story or character depth, you’re pretty out of luck. April and adult Jordan are so one-dimensional at the beginning that they’re nearly caricatures of characters you’d expect to see in a comedy. Anything mean-spirited that a person could do or say to another person, Jordan does; on the other hand, April is as sweet and kind-hearted as they come. The story is about as straightforward as they come, too, with no real twists or turns. The film would be all but a bomb if they didn’t pick a strong cast capable of showing conviction, and this is where the three leads absolutely shine. It feels like Regina, Issa, and Marsai had a tremendous amount of fun making this movie, as they take their characters and run with them. Audience reaction plays a big role in how successful comedies are going to be, and on more than one occasion, I heard audience members react enthusiastically to how Regina treats others or Marsai reacts to her situation. To that end, it wouldn’t be a successful comedy if it didn’t make people laugh, and I have to admit, there are some damn funny scenes in it. A part of me worried I wouldn’t find it all that funny, as I don’t know whether I’m really the intended target audience, but I think there are certainly enough moments that anyone could find funny. I brought my co-worker Lauren along with me to the screening, as I wanted to get a woman’s perspective on the film, and she confirmed a lot of my thoughts, right down to giving it the same letter grade. She laughed a decent amount, but did note that “the character roles and dynamics we’ve seen time and time again.” She did give high remarks to the actor portrayals and the comedic writing. 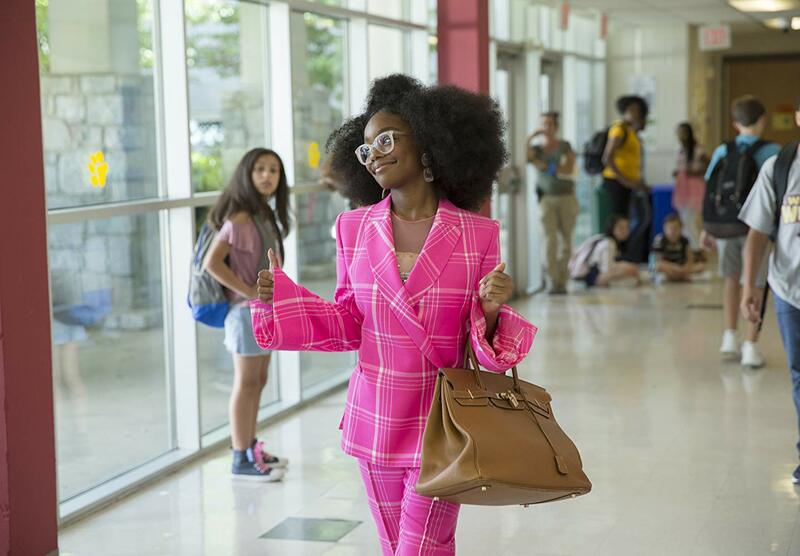 I can’t see Little become an instant comedic hit, but at the same time, I think it could be the perfect vessel to launch Marsai Martin into a broader spotlight. She steals the scene just about every moment she’s on screen, and for her to have been an executive producer at the age of 14 is a tremendous accomplishment. It’s a very predictable film, but that doesn’t necessarily mean you can’t enjoy it for what it’s worth; you may know you’re having steak for dinner tonight, but that doesn’t mean it won’t be delicious. Just don’t go into it expecting more.